Generic Company Place Holder Dictionary! A really good dictionary is an indispensable part of any library, home or office. I have three unabridged dictionaries in my office, along with two thesauruses and maybe a half-dozen dictionaries devoted to specialized subjects. Stacked on my living room floor, my reference books come to my chin and easily weigh 100 pounds. And at the moment I have eight dictionaries, including two unabridged volumes and the compact Oxford English Dictionary, on my much smaller, much lighter iPhone. What a world! 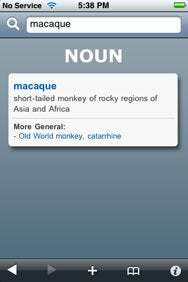 There are dozens of dictionaries available from the App Store, with the triumvirate of Merriam-Webster, American Heritage and the somewhat abridged OED. I wondered how some of the upstarts stacked up with the Big Three. I selected five of the most popular free or inexpensive dictionary apps for the iPhone and iPod Touch for comparison. My assessment of the app versions of the Big Three will appear in a separate review later this week. With all of these apps, I decided to play “Stump the dictionary.” My word of choice was panjandrum, which Webster’s will tell you means “a powerful personage or pretentious official.” (Incidentally, J.N. Hook’s long out-of-print book, The Grand Panjandrum, not current events, inspired the pick. This Definition Brought to You By...: The free Dictionaire has an ad banner running across the top of the screen, but it’s pretty unobtrusive. Hampton Catlin’s Dictionaire is the most popular dictionary in the App Store, undoubtedly because of the price. The free app is a bare-bones word finder, with more than 140,000 definitions in its database. Panjandrum, alas, was not one of them. Dictionaire is easy to use. Simply start typing the word you are looking for and the app will helpfully supply suggestions. The developer says he created the app as a convenient reading aid. This relatively unambitious reference tool is handy for casual readers in need of a quick definition, and not much else. So what you get is the word, its part of speech, and a short definition, but no pronunciation help or etymology. As with most free apps, Dictionaire includes an advertisement banner at the top of the screen, but it isn’t too obtrusive. Dictionary by xyster.net passed the panjandrum test easily, but came up slightly short in the interface exam. How Do You Spell That? : Dictionary from xyster.net finds words even when you can’t spell them. Enter a misspelled word, and the app will generally return the word, or a list of similar sounding or spelled words, you are looking for. Tap the word you’re looking for and up pops the word, its part of speech and a list of definitions. One nice feature: The definition words are hyperlinked, making Dictionary a helpful thesaurus as well. Dictionary also maintains a history of your searches and lets you bookmark words for easy future reference. 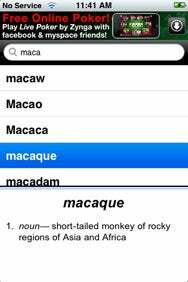 The app’s update boasts the addition of pronunciation—with the option of selecting Merriam-Webster or International Phonetic Alphabet styles—but that wasn’t consistently the case with several words I searched. Panjandrum, for instance. But the app’s interface is clunky and somewhat counterintuitive, and the buttons are sluggish. When you tap a word for its definition, the app switches from the search mode to dictionary mode. You need to tap the search button to return to your original list of words. I kept wishing the app had a back arrow, or a finger-slide feature instead. When I bought Dictionary for this review, it cost $2. As this review was published, the price has risen to $8. That’s an ill-advised increase—there are better dictionaries for the money. 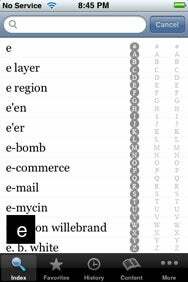 What Can Brown Do For You: Dict-English has a unique look, but white-on-brown text can make for some difficult reading on your mobile device. Bluepal’s Dict-English Dictionary also passes the panjandrum test and falls well short in the interface and functionality tests. Misspell the word you’re looking for, and you’re out of luck. The app’s unique light brown border and white-on-brown text distinguishes Dict-English from its competitors, but makes for tough reading. There is no way to adjust the type size. The November 17 update of Dict-English fixed a confusing design element of the app, which made its thesaurus the default setting. You need to click the settings button on the bottom right of the screen to switch between the dictionary and thesaurus. Related Words: Concise English Dictionary features voluminous definitions and includes hyperlinked synonyms with each entry. 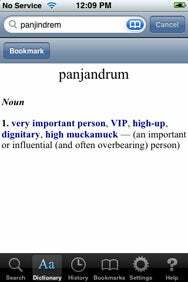 jDictionary Mobile’s Concise English Dictionary knows panjandrum and about 1.6 million other words, terms, and people. I would compare it to the free Dictionaire app and judge it superior in terms of sheer volume. The app’s interface looks pleasant, too—although, once again, there is no way to adjust the size of the app’s display type. Why developers don’t include such a feature as a matter of course is baffling to me. You can browse the Concise English Dictionary by simply clicking the empty search field, although there is no A-Z scrolling function, so scrolling is a chore. But the search feature is fabulous and fast, and the app has forward and backward browsing. You can bookmark entries for future reference. 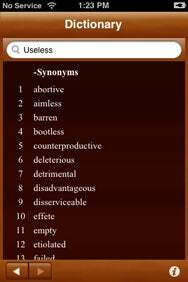 And each entry includes hyperlinked synonyms. As with the other dictionaries reviewed here, the Concise English Dictionary skimps on pronunciation and etymology. On the whole, however, the app’s clean interface, speed, size and make it a compelling and useful addition to the iPhone or iPod touch. Triple Word Score: WordBook features a three-tier A-Z scroll that lets you search for words by tapping in their first three letters. None of the aforementioned apps, however, quite compare to TanCreative Software’s WordBook. The developer boasts that it is the “most downloaded commercial English dictionary” in the App Store. It’s not hard to see why. Wordbook’s interface is clean and professional, with customizable text size. When you examine an entry, you can finger drag the page to reveal more options, including a favorites button, multiple Web links, and the app’s thesaurus. When you launch WordBook, you get the words of the day. Note that it’s words, not word. Touch a word, get a definition. (“Wassail,” a noun, is a punch made of sweetened ale or wine heated with spices and roasted apples; especially at Christmas.) Shake the device, get more words. WordBook handles partial matches and wildcard searches with ease. And WordBook’s browser has a feature I hadn’t seen before: A three-tier A-Z scroll. You can tap on the first, second and third letters of a word or word family and WordBook will jump instantly to that section. WordBook doesn’t have quite as many entries as the Concise English Dictionary—150,000 entries versus 250,000—but WordBook is more thorough. Each entry includes the part of speech, a short definition, hyperlinked synonyms and, yes, pronunciation. Some entries even have etymology. And in cases where the short definition isn’t sufficient—as with certain proper names or concepts—you can tap the “web” button behind the main entry screen. If you have a Wi-Fi connection, WordBook will launch Wikipedia or Google Answers within the app and expound on the word. As a bonus for puzzle and Scrabble lovers, WordBook has a nifty crossword finder and anagram maker. As dictionaries go, WordBook offers very good resource at a great value. That said, none of these dictionaries is as good as Webster’s New College Dictionary, let alone the unabridged Third International or the OED. You really do get what you pay for, as we’ll see when I review those three offerings.